Hi, everyone, just a quick update on the book marketing companies I’ve tested in January. It was only a few, since I wanted to make sure that the results I was getting were due to a specific promo and not an overlap. BookHearts, a subsidiary of Choosy Bookworm, had a second chance on 9 January, but something went wrong and I only got 2 sales. I’d contacted them and they agreed to run the promo (whether the first time or again, not sure) on 18 January. See for yourself- I got 5 sales. The cost was $5, which is not much, but the result is still disappointing. What was even more dissapointing is that I’ve tried to contact Jay from Choosy Bookworm/BookHearts a number of times, and never got a response OF ANY KIND. Makes me want to start a “blacklist”. On 14 January it was BKnights via Fiverr turn. I paid $5, even though I saw mixed reviews. I got 4 sales and didn’t bother to ask why. On 16 January it was Choosy Bookworm. I got the “Guaranteed Feature” on sale for $19. Sold 11 copies. I contacted Jay, just like I did for BookHearts – no response. I can’t be more disappointed – blacklist it is! 19 January – I screwed up and did 2 giveaways. I will need to re-run and re-test Buck Books – the link is to their policies, but to apply to advertise you actually need to contact Jennifer directly on jennaputt@gmail.com. Claim to have 42,000 subscribers. Cost – $12. I also did eReader News Today again, at $30. 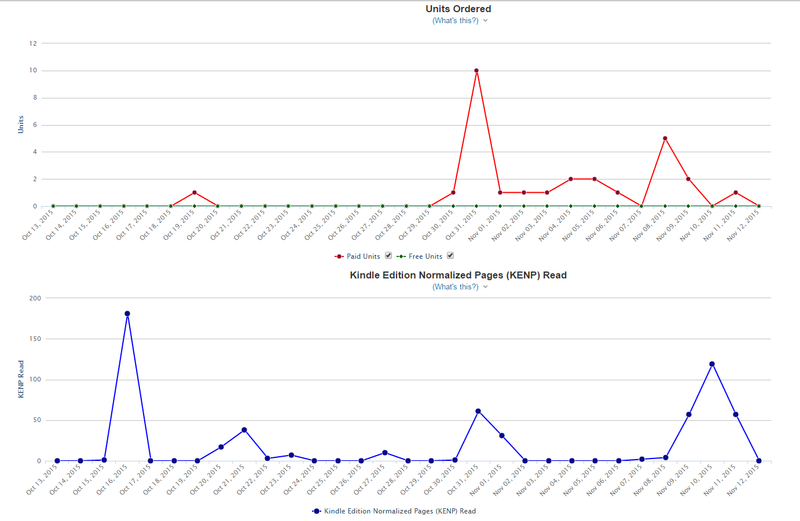 Total sales were 44 on the day, plus about 2,000 pages read in the next few days. 31 January – Betty Book Freak. Cost: $12. Sales – zero (if you don’t count the pages read). To give Betty credit, she promptly refunded my money. 2 February – eBook Soda. Cost: $15. I got one sale. Once again, they refunded my money, so I will leave them in “try for yourself” category. I have not scheduled any other promos yet, a bit burned out (it takes a lot of time) and also, this month I’m playing with Amazon pay-per-click promos. Ever wondered if it’s worth it, what to set as per-click price, and whether to use categories or associations with other products? Results in a couple of weeks! Don’t hate me cause I’m marketing! My previous post on pricing a first self-published book at $0.99 generated quite a discussion! Once again it shows just how many opinions are out there – some support my strategy, other authors are unhappy with having to give the work away practically for free. My personal view is “this is just what it is” – a free market, where prices are set by the laws of supply and demand. I do think my 2.5 years of hard work are worth more than $0.99, but I will just concentrate on promoting it so hard that before you know, it will be a series and a movie, and I will buy a pair of Manolos, just to see what all the fuss is about. My goal is to get the book into hands of as many readers as possible, with the hope that one of them knows Coen brothers. Seriously, does anyone here know even one of those guys? Back to the argument of $0.99 vs $X.99. My limited research of two or so months shows that you will get not only better sales, but also better royalties with the $0.99 pricing. How can I prove it? With the power of screenshots and basic math. 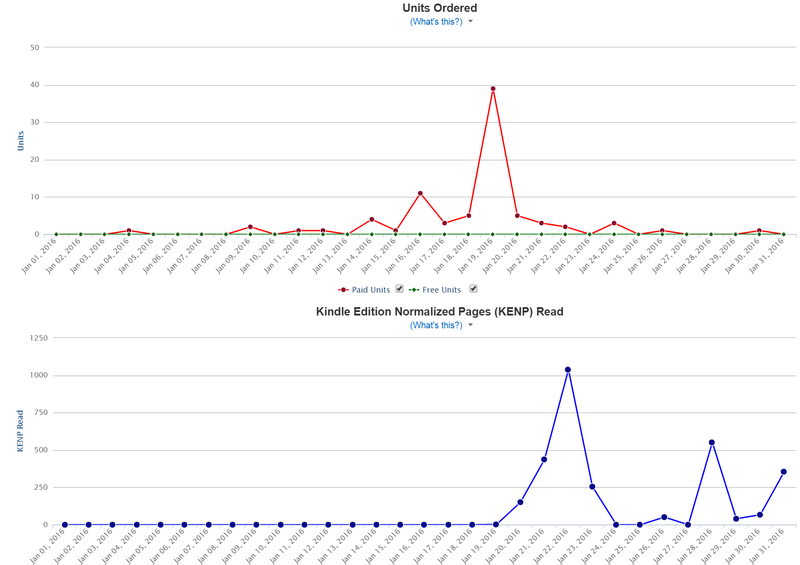 For simplicity, let’s concentrate on sales alone (it looks like “pages read” was pretty even over time). During the first half of the month, my price was at $2.99, and it was $0.99 in the second half. I sold 1 copy at $2.99 and 27 copies at $0.99. The royalties were $2.04 and $0.35, respectively. The math, ladies and gentlemen! I’m depressed now, because the numbers are so dismally small, but that’s besides the point. The point is that I had 17-27 times more sales and about 3-5 times more royalties when I’d dropped the price. The hope is that some of those people will talk about it to their friends. The goal is to get a snowball rolling, so that I (eventually) get a million of these tiny sales. I guess the time will show if this is overall a winning strategy. The only concern is the inability to advertise with some of the websites that require the book to be discounted by at least 50%, but I hope that by zig-zagging the price, I will comply with that requirement. Oh, and I have a very exciting update about Bargain Booksy! I’ve emailed them, asking if 10 copies is what I should expect from a promo, and they responded! Not only that, they apologized, said it was too low for the quality of my novel, and offered a $25 credit towards another promo! I was speechless and promptly scheduled a promo for 5 December with a different audience, this time with Chick lit/Romance readers, at a cost of $70. I’ve updated my post on The Most Super-Duper, Exhaustive, Comprehensive, and Current Listing of Free and Paid Book Advertising Websites and Ideas accordingly.